There are still comparatively few women working in science and technology. Recent studies show that only 23% of science, technology, engineering and mathematics (STEM) professionals are women, and 27% of these are likely to leave their job within the first year. So, why aren’t more women entering and remaining in science and technology? What’s causing this gender gap? Geeky Girl Reality is a longitudinal, independent research project looking at how women’s experiences influence their interests in science and technology. We’re drawing on data from a spring 2016 survey of 163 women between the ages of 15-46 from 16 countries around the world. From their stories, we learn about the effects women’s experiences have on their pursuit of higher education in science, technology, engineering, and maths. We have discovered some interesting insights. To start, we’ll take a look at our participants’ early life experiences and how their plans are affected by their childhood interests or mentors. This trend can be seen from the bar graph below, which compares our survey participants’ childhood interests to their 10-year plans. 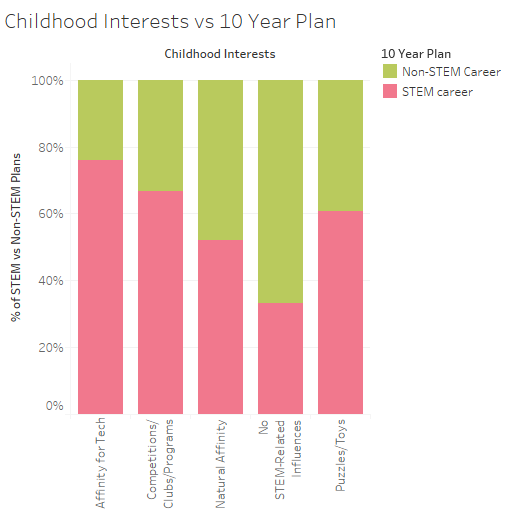 On the horizontal axis, each childhood interest is listed along with a bar representing the corresponding 10-year plan responses. The pink bars are the percentages of women planning to pursue a STEM career; the green bars are the percentages of women planning to pursue a non-STEM career, or there was no indication of a career plan. At least 52% of respondents with an interest in technology or science as a child had a 10-year plan involving a STEM career. This rose to 76% for those with an affinity for tech. The 33% of young women who lacked exposure to science or technology said they were more likely to go into other areas instead. We can see this by comparing their mentors (on the horizontal axis) to their 10-year plans. More than half of women with no mentor or with an unrelated male mentor did not plan to pursue a STEM career. By contrast, women with an unrelated female mentor were the most likely to pursue STEM, with 68% of them indicating a STEM-related career plan. It appears that women are most encouraged when they have another successful woman as an inspiration. It’s possible that male mentors are not as easy to relate to, and made them feel like they didn’t belong in the relevant fields. Talk to young girls about science and tech to give them the opportunity to explore those subjects from a younger age. Encourage the women you know to become mentors for other women and girls who are just starting out on their career paths. If you’re a woman in science or tech, consider becoming a mentor yourself. Establish a mentorship program within your organization to empower female employees in science and tech. Implement more science and tech courses in early education to increase young girls’ exposure to these fields. This has just been the start of our exploration into the experiences of women in science, technology, engineering, or maths. Keep an eye out for more posts as we look at other influences affecting women’s careers.